Hemel Hempstead Amazon workers' report: 'Power hour' or Workers' Power? With our Amazon workers’ reports we hope to not provide yet another sad victim story of how Amazon turns humans into semi-robots. We leave this to the mainstream media. I worked for Amazon in Hemel Hempstead from mid-October until early January during their peak period. Like many of my workmates when I started the first impression of Amazon was good. They had a lot of focus on health and safety, free coffee and tea, a nice canteen with games in it, and a seemingly well organised warehouse. However, whilst working there I quickly realised that these were just things that made Amazon look good on the surface, but in reality they did not care about workers and were just using us for a short time before getting rid of us no matter how hard we worked. When we started in October all the temps were paid £8.20 an hour. Quite a few temps started in that period but it wasn’t enough for the peak period so Amazon tried desperately to lure more people to join them. First, they told us that we would get more than £1000 in bonuses if we referred up to 5 friends to work with Amazon. That sounded great, but the big catch was that we would only get paid that bonus if both we and the people we referred stayed until Christmas. Of course, most people were fired well before that and strangely enough I never met anyone who had ever received a reference bonus. Another way they tried to attract people to join them for the peak season was giving temps contracts that were supposed to last 9 or 11 months. Unfortunately, a lot of temps believed that if they got a 9 month contract they would work 9 months. Imagine their shock when they, like most others, were fired after 1 or 2 months. Some of my colleagues had come to the UK for the job under the expectation of working for Amazon at least the length of the 9-month contract. When they were then fired after a few months they suddenly found themselves without income, unaffordable bills, and few job prospects so most of them were forced to leave the country again without any of the savings they had hoped to earn at Amazon. Despite these efforts they were still short of people for the peak period so around mid-November they started to offer £10 an hour to new temps. This, of course, upset a lot of people because we were all doing the same job and Amazon could clearly afford to pay us more. Yet it was only the new temps who got £10 whereas all the other more experienced temps got paid £8.20 and even the permanent staff who had been there for years got paid less than the new temps. The permanent staff say it is the same every year and that Amazon could easily pay everyone £10 an hour, but that they don’t care about the workers no matter how long they have been working for them. The properly biggest group of workers seems to be from Romania. Amongst non-Romanian workers there is sometimes the perception that Romanians get preferential treatment both in terms of the tasks they get to do and whether they can stay on for a long time. However when you talk with Romanians themselves they seem to believe that because there are so many Romanian managers they are treated worse because Romanians don’t want to see other Romanians succeed. My own impression was that how you were treated by management mainly depended on how much you sucked up to them rather than your nationality. There are more men than women working there but a higher proportion of women in Amazon compared to other warehouses I’ve heard of. Age-wise, most are probably in their 20s but there are all kinds of ages ranging up to people in their early 60s. The English level was generally quite good. There were some people at the day 0 introduction who seemed to struggle with English, but after a few days I didn’t see them again. Also when I registered with Adecco I overheard a conversation amongst the agency staff that seemed to mention a “Romanian shift” which was where all the managers and workers were Romanian and therefore there were no requirement to speak English. I never met anyone though that did not speak English good enough to complain about working at Amazon! For a lot of people Amazon is seen as a short gap job either to earn money before they go to another country or whilst they are looking for another job. However, “short term” can still mean that they plan to work at Amazon for the length of the 9 month contract, few people only expected to work there for one or two months. People had worked in, or were looking to work in a range of different jobs. So some were looking for graduate types of jobs, others were looking for technical jobs like electro mechanics, there were people who had worked office jobs their whole life, there were people who had been in retail as assistant managers before. There were people who were looking to continue their studies here or somewhere else. It seemed to be quite a diverse mix of backgrounds. In my department the relationship between permanents and temps was friendly although in general I feel like people tended to talk more with fellow temps or permanents. Who people talked with also depended on when they started, and to some extent ethnicity. The permanents did not seem to blame the temps themselves for raising the targets, instead they were pretty clear that it was management who were to blame. Although there are a lot of “blue badge”-staff – people with a permanent contract – that are Romanian, there are also quite a mix of English, Polish, and Hungarian permanent staff, especially amongst the ones who have been there more than 3-4 years. Colleagues talk to each other. To my surprise people were pretty openly complaining whilst working. I would often find groups of 3-6 people of ICQA (Inventory Control Quality Assurance department) people, stowers, cleaners, and others standing and discussing the work. For pickers it might have been different. Actually during breaks I feel like there was less time to talk about these things as we were too busy trying to eat and drink some tea/coffee before the all-too-short break ended. After shifts people seemed to rush as quickly as possible to get out. Sometimes before the shift people would arrive early, but talk less because it was early in the morning etc. When many temps start they are eager to do well because they hope that they will get a “blue badge”. Amazon knows this, and they encourage the temps to work themselves half-dead for a few months even though only a fraction will ever get a blue badge. They then use the performance of the temps to increase the targets for the permanent staff for the rest of the year. This has been happening year after year meaning that the targets keep on slowly increasing without end. One way they try to push us to work harder is “power hour” where for an hour or two we have to work as hard as we can. This is taking place during peak time where we are already working longer and harder than normal. The fastest person will then be given some token reward of half an hour extra off for one day or £50. For the rest of there is no reward other than the ‘fun’ of seeing how fast you can work for your manager whilst exhausting yourself even more than normal. I was told by some permanent staff that once the power hour period has finished, management will use the higher performance during power hour to increase daily targets for workers who stay behind after the peak period. A lot of people knew that, so they decided to work slower during power hour – because what’s the point of working hard as hell so that management can look good and increase your targets? My department, ICQA (Inventory Control Quality Assurance), deals with a range of different issues, but their main task is to try to ensure that the estimated stock in the ‘system’ corresponds with what is physically present in the warehouse. In practice that means that we are mainly spending the day counting how many items are in the different bins (called Simple Bin Count or SBC). Like with other processes we use the scanner and it will tell us what bin to count. We then count how many items are in the bin and if it corresponds with the amount of items that the system thinks is in the bin than we immediately go on to the next bin. If there is a discrepancy than we have to recount the bin to make sure we got the right number. To check we got the second count of the items correct there will then be someone else from ICQA who will come to that bin and do a so-called cycle count (CC) which is where every item in the bin is taken out and scanned. In the pick tower, the work of the stowers, ICQA, and pickers impact on each other indirectly either through how well organised the bins are or whether we make any errors. However, I never experienced any instances of cooperating directly with people from other departments. In some aspects they are better organised than many other warehouses it seems (from my own experience and from listening to colleagues) so there are not too many things laying all over the floor and most times you can get a scanner (they got a bunch of new scanners whilst we were there) and it is mostly possible to get a trolley although sometimes they don’t work great. However after a while you start to see how there are a lot of things that are not working as good as they could. The most annoying thing is that it is a very hierarchical organisation where how the jobs are done seems to be largely controlled by some kind of algorithm. This actually makes things harder than it has to be. For example with ICQA the scanner might tell me to count the lowest “A” bin, then the highest F bin, then another A bin. So we have to stand up and sit down all the times which besides being a killer for your back and knees also takes longer. Also the pressure of targets ends up having a disorganising effect. So for example, we are supposed to put the bins in a neat order so that it is easy for the pickers to find an item, however, because they keep on increasing the target of how many bins we need to count per hour, most people don’t bother sorting out a bin which means that when they pickers come the bin will be a mess and it will take longer for the pickers to find the item they are looking for. Another thing they do is to try to hinder human interaction. In ICQA they changed the algorithm so that people don’t count bins in the same aisle. It used to be the case that you could count bins in the same aisle so you could chat and socialise with your colleagues, but now they changed the algorithm so people mostly end up counting bins standing alone in an aisle for hours. In terms of productivity I think that is actually counter productive because it is so depressing to only count bins for hours without any human interaction, so you work slower and at some point most people end up giving up and wander up and down the aisles to find colleagues to chat with. If there then is a difference between what we counted and how many items are there when the CC happens we will get an error. For every one million counted bins we are allowed to have 5000 errors (don’t ask me why they use these figures, but it works out to be one error for every 200 bins we count). Besides that we are also supposed to pull andons (an Amazon word I think, basically just means that something is wrong with the product). So if an item is broken we pull andons or if it is stolen we put a note on it and put it in the amnesty bin. I also think that we play a role in giving stowers and maybe pickers errors, but I don’t know in what way they do that. In terms of how we can get errors, besides miscounting the bin, which you could say is our fault, there are a number of other ways we can get an error. If, for example, after we have counted the bin someone misplaces an item in the wrong bin we could get an error. Or if someone open a chocolate package in the bin we counted we will get an error. Or if a picker picks up the wrong quantity of items we can get an error. Therefore, the longer it takes between when we count the bin and it is doubled checked with CC, the more likely it is that we will get an error. 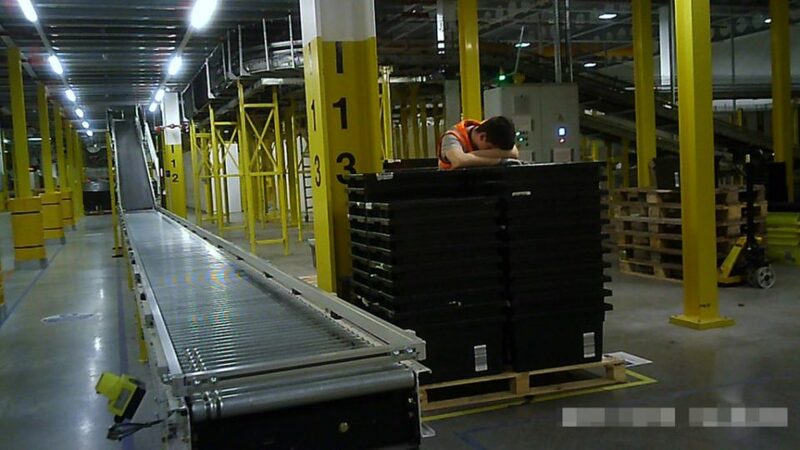 So at the end of my time at Amazon there were some rumours that the reason a lot of us suddenly got more errors and therefore more feedback was because they had increased the time between us counting the bins and it being checked with CC. Someone saw that it could take up to a week to check it and in a weeks time a lot of stuff can happen that will result in an error. I heard that there used to be a rule that there could be a maximum of three different kinds of items (so no quantity, but types of things) in the bins which made it a lot easier for both the pickers and the ICQA people. There also used to be a rule that you could not have similar looking items in the same bin e.g. having phone covers in two different colours which makes it harder to find the right item as you have to check the bar code. Also it was not allowed to have similar items directly above and below a bin. All of these things they got rid of (not sure exactly when) and it has made the job a lot harder and of course on top of that the targets have increased. I don’t know much about what they are planning with robots, but I am pretty sure that there are no robots yet who could rummage through a bin with 20 different types of items to locate a small ring hidden inside a book which is something we sometimes have to do. From the beginning Amazon seems to know that they will get rid of most of the temps, no matter how hard they work. To get rid of all the people without making themselves look bad they use many different methods. One common way to get rid of people is if they don’t meet their targets. Every week we got feedback from our agency. Normally feedback is also for what you do well, but at Amazon feedback is always about what you did wrong. So it could be that instead of picking 100% you “only” picked 99.7%. It could also be about the number of errors you had, or it could be about too much “time off task”. Time off task includes everything from going to the toilet, changing a broken scanner, going to talk with your agency or manager, looking for a trolley when there are none, and going on one of the breaks we are entitled to. So it is easy to suddenly have a lot of time off task even though you are still working hard. Every week we would get feedback from the agency, however they didn’t really seemed to know what they were doing so I would only ever get feedback for one of the things I did (Simple Bin Count) and not the other things I did like Cycle Count. On top of that we would also get feedback from the Amazon managers and in the beginning most of the times the feedback from the agency was not too bad but from the Amazon managers it was always very negative. This changed when they built up to fire us and we started to get more negative feedback from the agency. We got training from the other people in the department. For me it seemed like that the agency’s main role was to eventually fire people. They didn’t seem massively helpful for much else. In the beginning when we get feedback the agency staff would tell us not to worry about it and it doesn’t seem like a big deal, but around Christmas time, when the peak period will soon finish, everything changes. Suddenly most of the temps get final warnings for even minor slip-ups. Like one of my workmates got a final warning for only picking 99.7% one day, and he was not even normally working as a picker. I also got a final warning for having too many errors even though the number of errors I had was less than I had the previous weeks. The people who were first targeted were the people who were earning £10 an hour. Scores of them were fired several weeks before Christmas. After that it was the temp workers’ turn. By the time of the first and second week of January a large number of temps had already been fired. To get rid of even more temps Amazon were then so ‘kind’ to tell us on Christmas Eve that they had decided to get rid of all the company buses that had been ferrying in people from London and Watford for the peak period. A lot of the temps, including me, relied on the buses to get to work. They were not free and we were charged £2 each way, but without the company buses we would have to pay a taxi to go there as there were no other public buses that went early enough to make it for the day shift. Also, the public buses would have costs around £9 each way so they were not really affordable anyway. So with no buses to take me to work, I had to quit. A few days before that some Adecco staff went around with a list asking people if they would stop because of the buses. I could see from the list that most people said they would stop, even the agency’s own worker told me he had to stop working because he came in with the buses! Another issue is that if you try to call in sick too much you will get in trouble. The job you do is often repetitive and after a few weeks it starts to wear you down. At one point my back started to hurt so I called in sick for a few days in a row. When I came back I was called back by the agency, who asked me how I was feeling and why my back hurt. I told them it was because of the repetitive job and I asked if I could be transferred to another position. I was told that if the work made me ill they would have to send me home for health and safety reasons. I didn’t want to be fired so I had to shut up about it after that. Some colleagues also had trouble making use of their holiday pay when they fell ill. They were told they could take time off but it would have to be unpaid because they had to give two weeks’ notice before using their holiday pay. This all sounds bad, but don’t believe that the workers just sat and took it like the good victims the newspapers like to write about every now and again. In the beginning a lot of people had high expectations of working with Amazon, but after a few weeks they started to realise what working for Amazon really meant. So after a few weeks you started to hear more and more angry and incensed discussions amongst workers around the aisles of the pick tower. Workers who in the beginning tried to run themselves into the ground trying to reach their targets, now having realised it didn’t make a difference in terms of getting a long term contract, stopped stressing about targets and deliberately worked slower than they could. In the beginning we were all worried about even going to the toilet because we might get a warning for “time off task” but after a few weeks when we started to realise we would all be fired soon anyway more and more people started to take “extra” breaks, spending time talking with colleagues, wandering around the warehouse, going to the canteen to grab a cup of coffee, playing a game of ping pong, and of course not giving a toss about ‘power hour’. The permanent staff already know that Amazon don’t care about the workers and the temps quickly learn it, and a lot of us start to do minor individual acts of resistance. That is all a good start, but if we want to change the way Amazon treats us we have to work and resist together! After last year’s report about working at Amazon in Hemel Hempstead for 7 weeks in the peak period I thought that I had enough, but destiny reserved me a surprise for autumn 2017. After some weeks without getting more than 2 shifts a week being self employed through the Amazon flex app, I had to look for another job and I found myself again at the Amazon warehouse (or fulfilment centre) in Hemel Hempstead. This time I started the last week of August. I was employed by a recruitment agencyand was placed in the picking group and afterwards also shipping, instead of packing as last year. This gave me the chance to have more knowledge of the way Amazon organizes different departments. I found many people I knew from working at Amazon during the previous year. They came back to Amazon because they had worse jobs during the year. Many said they would not like to come back next year. During the introduction day people have to do a basic English test. Later I found some people who struggled with English. Despite these language difficulties the atmosphere in general was quite good, I didn’t find language groups on the floor, people mix with each other. Only in the canteen you see that people socialise with their language fellows. Some temp workers work at Amazon because they want some money for future college education. Others, just like me, go from precarious job to another precarious job. I only knew of one case where a worker arrived recently from abroad (Lithuania) and planned to go back after the end of season. Most temps are placed in the picking and packing departments. Permanent staff are usually multitasking and trained in several departments, many are trained as instructors. In shipping the number of permanent staff is much higher than in picking or packing. I was surprised that the permanents didn’t look very happy, complaining about low pay, long shifts and the constant pressure. I will start with picking because that was my main department and where I spent most of my time. As last year, the first day is called “day zero”. I was together with 11 other people; we were given the badge to log-in and out and we were taken on a tour of the warehouse to familiarise ourselves with the different areas (such as the picking tower and its 4 floors, canteen, briefing areas, lockers, etc.) Health and safety procedures were explained to us and how to start using the scanner, as well as the difference between totes (which are plastic cubes where we put the items we picked) that could be yellow for ordinary customers or black, which were for trans-shipment between Amazon warehouses. After “day zero” you actually start working, but an instructor is assigned to your group just to make sure you know how to use the scanner and to solve problems that can arise like missing or damaged items. After 2 days of being monitored by instructors you are on your own. The main difference between picking and packing is that in picking you are all day up and down picking items while in packing you’re stuck standing all day long at a station. There are targets in the picking department: 120 items per hour. Unlike last year’s packing targets, these seemed more reasonable. The problem was that sometimes the scanner system went funny and made me do silly things like pick 1 or 2 items, close tote, go to floor 2, pick 1 item, then go to floor 4 to pick 2 items, then go to floor 1 to pick another 2 items and like this for 2 hours. Consequently your picking rate went down dramatically but you were asked to meet the same target. Fortunately this only happened maybe once or twice a week but was annoying because agency team leaders were pushing us to meet targets regardless of these issues. The jobs in the picking or packing department are very individual jobs. In fact you are on you own, you only depend on the fact that in picking you have a scanner, trolleys and totes, and in packing, enough boxes, tape and a working label machine. In picking you wander around, up and down the picking tower, on your own with the trolley and scanner. Occasionally you can stop and chat with colleagues, but not for long, because the target rate drops or you can be told off or disciplined by agency staff if they notice you haven’t scanned an item in 7 minutes. An agency supervisor told me that at their computer a message would pop up if someone hasn’t scanned an item for 7 minutes. In packing, on the other hand, you have to be standing in one spot at a packing station all day long. The stations are separated from each other, which means you rarely interact with anybody – only at some points with the guys who refill the cardboard boxes or fix the label machine (PGs). So you only talk to people on your breaks. In shipping it is more team work. Someone scans and others place the boxes in pallets/’gaylords’, wrap them, and put them into the trucks with pallet trucks. After 6 weeks I was trained in the shipping department. The positive point of the shipping department is that no targets need to be met, but later I found very dark sides to shipping. But first I will start from the beginning: the so-called ‘training’, which I found to be very poor. It lasted for 5 minutes – just to tell us about safety measures like wearing hi-viz vests and safety boots, the mission of the department, namely the importance of accurately putting the packages in the right slot to to go to the right truck – and that was it. Basically shipping is where all packages end up before being sent to the lorries/trucks before reaching their final destination. The packages came through chutes and are then are placed on pallets and/or a sort of cardboard cover called a ‘gaylord’. After the training I was released to one of the chutes on my own. Colleagues told me that some chutes had a green label with ‘pure’ written on it, which meant the packages go straight to pallet/gaylord without scanning and some other chutes had a yellow label with ‘100% scan’ written on it, meaning all packages have to be scanned before being placed in the pallet/gaylord. On the run colleagues told me how to use the system in shipping which is completely different from the picking department. The first week was frustrating, due to limitations on the system that didn’t allow me to use the full option of keys because I was in training, something which didn’t happen in picking. I personally found it very poorly organised in comparison with picking or packing where instructors are with you for 2 days to make sure you understand the system and solving peoples’ problems. In the 5 minutes training you are told how important the department is, because a wrongly picked item or a poorly packed item can be found before reaching the shipping department, but an error in shipping can send an item to a completely different location or even another country, with the added hassle of rescheduled shipment and wasted time – one of the main concerns of Amazon, which wants to be the “most customer-centric focused company on the planet”. It was a kind of shock after seeing quite decent organization in other departments like picking and packing, to see the disorganisation of shipping when it’s supposed to be ‘the most important department’ according to their proclaimed philosophy. Following shipment blunders, managers were sometimes moving from one chute to another, without explaining anything, leaving the destination labels on the same chute, even changing destinations for chutes that have to be 100% scanned with the ones that don’t need to be scanned. This lead to a huge bewilderment even for the permanent staff, creating a big mess at some points with lots of people on a few chutes whilst leaving other chutes empty. This way of working doesn’t make me feel comfortable. Besides, I was told that in shipping I don’t have to make targets, only to find out later that according to PMP agency, Amazon wants a target so that meant I had to go to picking at least one day a week to have a weekly target. In my second week I had a funny day with the system, I had 76% for one day and I was verbally disciplined for low picking target. For this and the other issues mentioned above I was avoiding shipping as much as I could and in the last week I even sneaked off to picking. When the media reported about the new Amazon warehouse in Tilbury I showed it to my closest colleagues. Apart from the awful working conditions the article also mentioned the issue of the use of robots. According to the report robots were doing the picking process. My colleagues and I talked about how a robot would not be able to do the picking as humans do. The workers in Hemel Hempstead have to pick in what they call a “bin”, which is where the item to pick is placed by the stowers. Only a few bins contain single items, most of them store multiple items. Some items are very small, like SD cards, key chains / key rings, watch straps, decoration stickers, postcards, make-up etc.. These are usually mixed with bigger items like pet food, kitchen / toilet utilities like bleach, toys, electric utilities etc.. Often smaller items are hidden behind or under those bigger items. We have been told that when we don’t find the items in the “bin” we have to scan every single item inside and only after having done this can we log into the scanner that we couldn’t find the item. My colleagues and me thought that a robot would have difficulties doing that: dealing with multiple items, putting bigger items on the floor, having some totes with 40 items etc.. Or they would get in trouble with their human co-pickers: one of my colleagues said that if we would work alongside robots he would pour some water on the machine in order to spoil it! In terms of Amazon policies I found some differences this year in comparison with last year. Last year if you wanted to move from one department to another there was a minimum of 12 weeks before you could change. But this year some colleagues that started the same day as me were trained in packing after 4 weeks. An issue that didn’t change was Amazon’s tricks to motivate people. They have what they call “power hour”, a method to motivate people to work faster, with a prize of a £50 voucher. I was asking colleagues if this was a voucher that you change for money, others were speculating that maybe it’s a voucher to spend only on Amazon or specific shops. I honestly don’t know because I asked and nobody knew. I never met the winner of the prize. Last year I knew that the prize was an Amazon Kindle Fire tablet, so you decide which is better. Amazon used another psychological trick, playing with the assignment of badges. Amazon separate temporary and permanent workers by the colour of the badge, if you are an “associate” or temporary worker you are given a green badge, a blue badge is issued to permanent staff only. Normally you need to be an associate for 12 months to get the blue badge and permanent contract, but this year this had changed, with some colleagues being given blue badges after just 4 weeks and still working through the agency and with the expiry date as 30/12/2017 when usually blue badges last for 5 years. Some colleagues told me that was a ‘management strategy’ to prevent people from leaving before the end of the peak season. They made them think that there was a chance to be permanent after 30 December, just to find out later that they had been “released”, as Amazon names the practice commonly known as being kicked out. In general the Amazon managers are helpful and friendly, they use the agency managers to tell us off. I would like mention about how the transport was organised. I used my own car, but talked to lots of colleagues that used the buses provided by the agency. The pick up points were in Wembley Central, Brent Cross, Harrow, Watford and Luton. This year the prices was reduced from £7 return a day, to £2 each journey making £4 a day, The problem was that in the last week I was there they announced the removal all of the bus services except the one from Luton and Brent Cross from the 5th January 2018 (which was after the peak period), leaving many people coming from Wembley, Harrow and Watford stranded. Some thought that was a strategy of pushing people to leave. In the last week I was there, work volume dropped a lot after Boxing Day and many final warnings were issued from the agency mainly due to performance. One colleague I spoke to told me that he was given a warning because he didn’t meet the 100% target, he only got 99.04%. This led some colleagues to think that this was another strategy to get rid of people who weren’t needed anymore. On my last day (before I knew it was my last day!) I saw a message on my picking scanner inviting me to go to the briefing area. There were 10 more people plus a member of PMP agency who ushered us to the canteen. Once in the canteen about 5 more people plus agency staff took us all to the 2nd floor where an Amazon manager gave a short speech on how important our work has been during the peak season and how thankful Amazon was for our sacrifice and dedication. Afterwards, PMP and Adecco staff gave a speech letting us know that it was going to be our last day of assignment at Amazon. This is how my work in Amazon ended, I hope people find my experience interesting. In the beginning we were all worried about even going to the toilet because we might get a warning for “time off task” but after a few weeks people started to take “extra” breaks, wandering around the warehouse, playing a game of ping pong, and of course not giving a toss about ‘power hour’.